Myra Kornfeld, the author, chef, and cooking instructor whose motto is “What is healthiest for you is also what is healthiest for the planet,” has released a new holiday cookbook. Serving as somewhat of a followup to her successful The Voluptuous Vegan and, more obviously, The Healthy Hedonist, The Healthy Hedonist Holidays offers a full year of recipes based around holidays for people from all cultural and ethnic persuasians. Beginning with Ramadan and ending with the Fourth of July, this book does more than offer delectable dishes for every occasion, it celebrates the vast array of cultural diversity that the United States is home to. Each holiday is briefly introduced and a bit of background is provided – did you know the first Valentine’s card was sent in 1415? and that Kwanzaa was founded in 1966? The recipes are just as informative and engaging as the holidays themselves. With notes on how to prepare up to several weeks in advance, Kornfeld makes a point of letting the holidays serve as a time of celebration, not as a time of frustration and exhaustion in the kitchen. In fact, some pantry-stocking suggestions are givenÂ in the first few pages, to ensure that would-beÂ chefs won’t be scurrying around at the last minute looking for hard-to-find ingredients. Some ingredients areÂ usedÂ in several recipes and some only in a few, but they are all listed beforehand, which earns Kornfeld points forÂ consideration and preparedness. There’s also a brief list of necessary equipment and basic techniques, though nothingÂ to in-depth or out of the ordinary is expected. Though the equipment and techniques may be commonplace, the recipes themselves are exquisitely crafted and presented. Each holiday features its own six-course meal. There’s no skimping here, and though chefs can feel free to mix-and-match as they please, these dishes have been carefully chosen to provide an optimal dining experience. Take Chinese New Year’s meal for example: starting with Shrimp and Eggplant Dumplings (with a homemadeÂ dipping sauce) and aÂ Crispy Five-Spice Tofu with Black Bean Sauce (there’s also Five-Spice Roast Chicken with Chinese BlackÂ Beans for the omnivore in the family)Â alongside Sesame Noodles with Wilted Napa CabbageÂ and Baby Bok Choy Braised with Mustard Greens and Black Mushrooms, these are no dishes to smirk at. The Almond-Orange Fortune Cookies are a nice final touch, and the helpful illustrations simplify a complex design. As Kornfeld herself stats in the intro, this book is designed with a flexitarian diet in mind. The newly popular dietary term describes those diners who may not be vegetarians themselves, but will opt for vegetarian or even vegan food now and then. Whether you are vegan, vegetarian, flexitarian, or just a plain-old “lover of food,” you’re sure to find something of interest in The Heatlthy Hedonist Holidays. It’s clear that Kornfeld has taken great care in presenting both healthy holiday options and creatively inspired dishes. Why wait for the holidays? Take this cookbook home tonight and try something new. 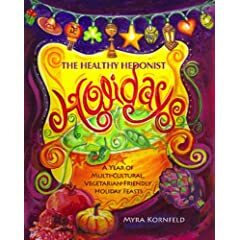 No user commented in " Book Review: The Healthy Hedonist Holidays: A Year of Multicultural, Vegetarian-Friendly Holiday Feasts, by Myra Kornfeld "